Often when a brutal act is committed against another person someone will refer to the perpetrator as an "animal". In reality, however, no animal - or to be more precise, no non-human animal - would ever act as cruelly as humans do. Last week a defenceless little dog was cruelly stabbed to death. A despicable act I'm sure everyone would agree. But imagine if you lived in a place where stabbing a defenceless animal to death was regarded as entertaining and the perpetrator was even awarded a gold badge and a forged iron lance by the town council. Incredible as it sounds, this is what happens in Tordesillas, Spain, and the stabbing will occur soon. I was reminded of this when reading about the forthcoming fiesta to be held in Tordesillas, Spain on September 14th. 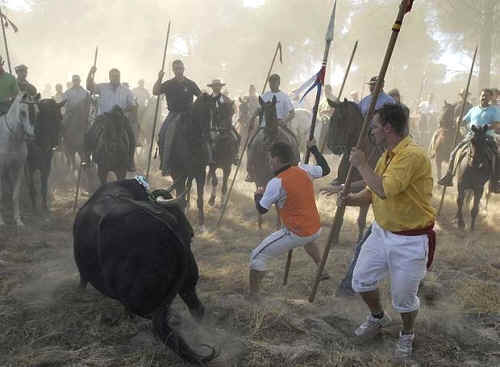 Each year on the Tuesday following Patron Saints Day the "Toro de la Vega" takes place. A bull is released near the town centre then driven by spear wielding horsemen across a bridge on the edge of town. Here one hundred or more men armed with long, medieval lances stab the animal for up to an hour until bleeding profusely and riddled with holes he can stand no more. As he collapses someone sticks a dagger into his neck then cuts off his testicles while he is still alive. In the 2000 festival the bull had a spear through his body for 35 minutes before being killed. 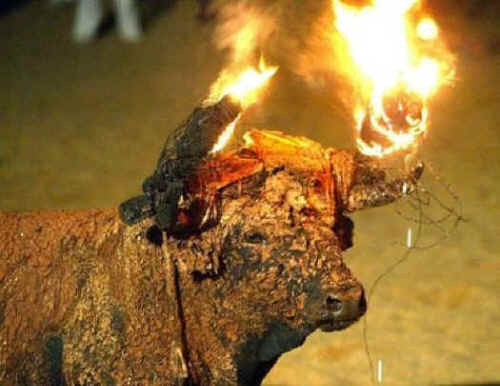 Each year upwards of 15,000 animals are tortured in similarly cruel blood fiestas throughout Spain and this cruelty is replicated in Portugal, Mexico, Brazil and many other Spanish speaking countries. Perversely, these fiestas are most popular during religious holidays and Easter Week with never a word of objection from the Catholic Church. The "Toro de Fuego" comprises fixing balls of tar to the horns of bulls then setting them on fire. To add to the animals terror, fireworks may be thrown at him or attached to his horns. As he runs in panic, the fire is stirred up even more, burning his horns, eyes, face and body. 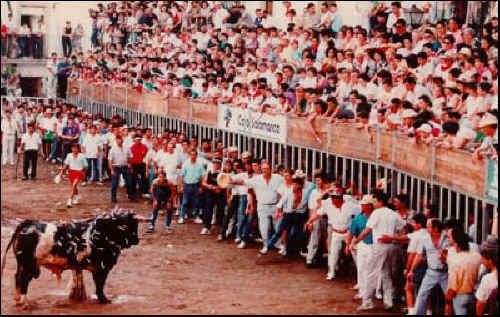 During the "Fiesta de San Juan" in Coria a bull is made to walk for several hours while being tortured with darts directed specifically at his eyes, nose and testicles. Eventually the pitiful animal resembles a pin cushion. Several hooked spears are then plunged in and out of his flesh and when he finally collapses from the pain, stress and blood loss his testicles are cut off. Each year hundreds of oxen are tortured in Brazils numerous "Farra do Boi" fiestas. An ox is confined in a pen for two days with food and water in sight but out of reach. When released he is chased by locals who torture him with knives, whips, and stones while striving to keep him alive for three or more days of torment. He may be doused with petrol and set on fire and his eyes are typically gouged out after participants flick pepper into them. His tail is severed, his horns are broken and his legs may be broken or hacked off. In Mexico's "Embalse de Toros" bulls and cows are forced to drink spirits then made to swim through a deep river, tied to boats. Once they arrive ashore, they are chased and tortured with knives and other weapons, until they die. Mexico also holds baby bullfights that pit knife-wielding audience members against calves, some only weeks old. The free-for-all ends when participants slice off the conscious animals’ ears and tails. Besides bulls, cows and calves many other animals are also tortured. Often an old donkey is forced to carry the towns fattest man. When the animal can no longer walk youths join the fat man and squash the animal to death. Chickens are hung by their feet from a rope, and decapitated by a blunt sword, or by having their heads pulled off manually. A variation of this is burying the birds in the earth with their heads sticking up, then beating them to death or hacking off their heads. Ducks have their wings clipped and are thrown into a river or the sea and dozens of swimmers try to catch them. The birds can be pulled apart in the tug of war. Pigeons and squirrels are placed in earthenware pots and suspended from a very high pole, The pots are stoned until they break and the birds and animals fall out alive or dead. The thing that makes these blood fiestas so particularly abhorrent is the fact that they have one purpose only - to deliberately and sadistically inflict the maximum amount of pain and terror on innocent creatures. Abhorrent, too, is the fact that by refusing to denounce them the Catholic Church is seemingly endorsing them. These cruel, satanic-like rituals have no place in a civilised world and it's time decent people everywhere demanded an end to them .